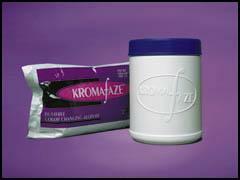 The color change of Kromafaze Alginate offers a visual guide for consistent impression making. The superior strength and physical characteristics of Kromafaze assure an easy-to-mix material that produces a surface of unsurpassed smoothness. Purple faze: mix; pink faze: load; white faze: seat. Remove the tray 30 seconds after seating . (Mint scented).